In January, I’m tackling another 31 day project. This month I am concentrating on everything in the kitchen. 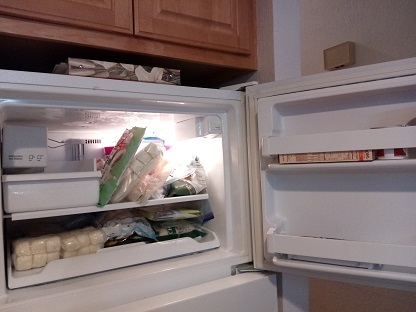 Our fridge, freezer, and cupboards have gotten out of control. My menu planning and grocery shopping has been in shambles, which means our grocery budget has spiraled out of control. This first week of January has been crazy with the girls going back to school, starting up therapy sessions again, and a trip to the ER. So I haven’t been able to blog about my goals for January but I have been working on them! The very first thing I tackled was our fridge. It was a mess! I forgot to take pictures as I went but imagine wilting vegetables, expired condiments, and stale bread. Spills on shelves. That’s all been cleaned up and it’s now much easier to tell at a glance what we have available to eat or cook with. 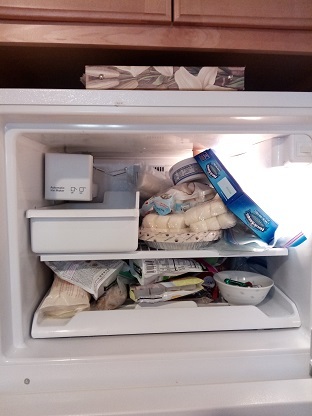 Secondly, I tackled our freezer. I’m not sure you can tell the difference in the photos, but I threw out several bags of disgusting frozen bananas. We also ate a couple bags of things that were getting low. Then I organized the rest. After cleaning out the fridge and freezer, we were able to buy some basic supplies I hadn’t even realized we needed. Our meal planning has really been that much of a mess lately that I didn’t even realize what we have or don’t have. Ramen has been a fall back once a week for the past few months. We’ve also been eating a lot of rice and tofu with various sauces. Meal planning has been so stressful that I can’t even remember what we used to like to eat. My girls have gotten more and more picky, causing more and more anxiety on my part, so meals have really been a mess. That’s what I’m trying to fix this month, one small step at a time. This week I’ll be concentrating on my recipe book. I have a binder stuffed full of recipes and I have no idea which meals we liked or didn’t like. I can’t even tell what recipes we’ve actually tried. I just printed a bunch of recipes, bought ingredients for many of them, and then promptly forgot why I had purchased sun-ripened tomatoes in a jar. They are still sitting in my cupboard, months after buying them. An expensive ingredient, too! I’m going to empty out the binder and go through each recipe one by one. Does it still sound good? Did we try it? Did we like it? I’ll slowly reassemble my recipe binder with recipes we actually like so that I can start working on a meal plan. As I type all of this out, it sounds overwhelming. But I’m going to concentrate on just one step at a time and try to regain control of my kitchen. I like your idea of testing out recipes for family meals. This coming weekend I plan on a thorough clean of my fridge too. All the best.